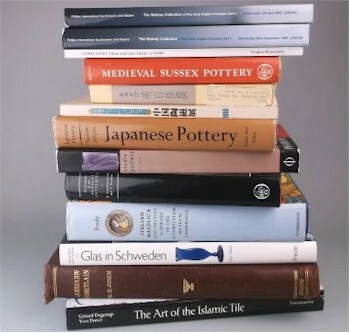 Whilst Bearnes Hampton & Littlewood does have a thriving Book Department, reference books are often best sold within sales containing the pottery, porcelain and glass they pertain to. Reference books are an invaluable resource to collectors, academics, dealers and researchers. As an exceptionally broad and varied discipline, useful reference books are an invaluable resource to collectors, academics, dealers and researchers alike, whether their favoured field is domestic, European or Oriental or whether they prefer aged folk pottery or contemporary glass and studio ceramics. Often produced in relatively small print runs and sometimes privately published to meet what might seem like the quirky needs of a particular niche, or field of collecting (a single factory, an individual modeller or maker) they can often quickly become difficult to acquire. The very nature of these reference works generally requires them to be hard back and extensively illustrated, something that makes them exceptionally useful and as a result more costly to produce. Seminal works, including the museum catalogues of national and provincial collections, are a reliable and referenced source of information, far more credible than the often transient 'knowledge' that is published on the Internet, and are often quoted by collectors, traders and especially auctioneers in their presale descriptions! Whilst many may consider old dealers and auction house sale catalogues to be nothing more than disposable magazines, especially if they have been annotated and scribbled upon, dispersals of single owner collections are to many an invaluable resource, particularly when proving provenance and they can also be an affordable reference source to those whose pockets are not quite so deep.